Hair and Glam on the Go! Whether you are glamming clients for a special occasion or you have a mobile business, your services are needed! There has been a huge increase for mobile services in the beauty industry. It's important to set yourself apart from your competition. Professionalism is key! Now is a great time to upgrade your supplies and equipment, and we have just what you need! Make-up artists will love the convenience of this professional accessories belt. 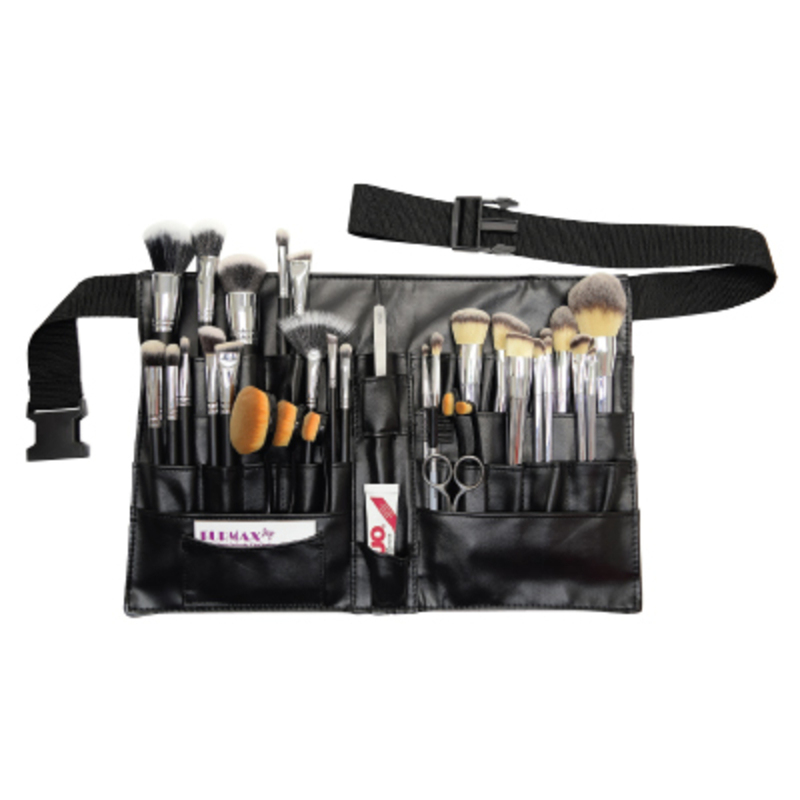 4 rows of pockets allow artists to hold a large amount of brushes and features extra space for holding business cards, cosmetics, and other essentials. This practical belt tools accessible, making it easy for artists to have with them at all times. Durable, easy-to-clean, leather-like material. Adjustable waist strap clips together for easy use. 10-1/2"L x 15-1/2"W. Items shown in tool belt not included. 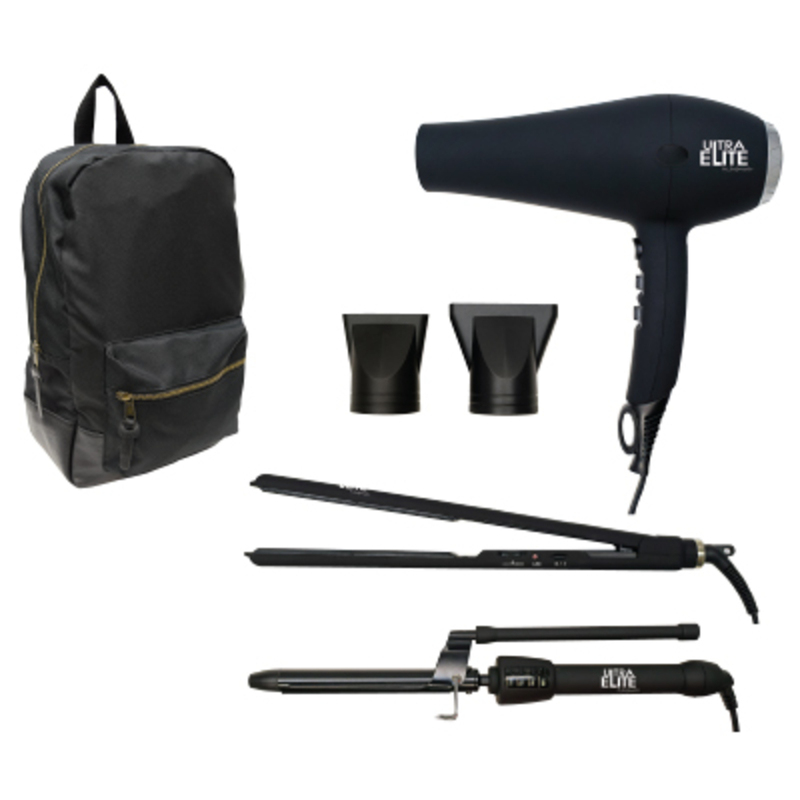 3/4" Tourmaline Ceramic Marcel Iron - heats up quickly, 3 heat settings: 300°F, 360°F, and 410°F, color indicator lights for power and heat settings, lockable handle, cool touch tip, foldaway safety stand, and 8-1/2 ft. tangle-free swivel cord. Lockable Nail Tech Tool Case with a detachable top is stylish, versatile, and perfect for the manicurist on-the-go. 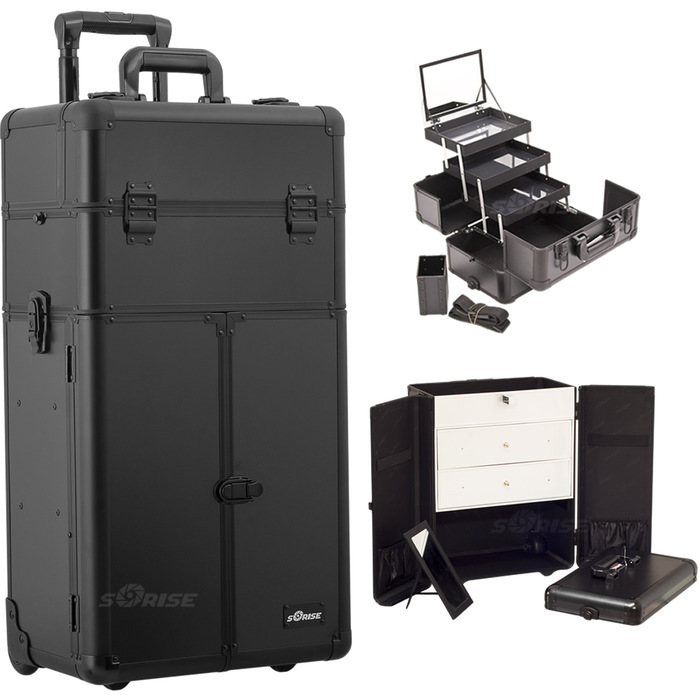 Features a shiny, black-diamond design with black aluminum trim. 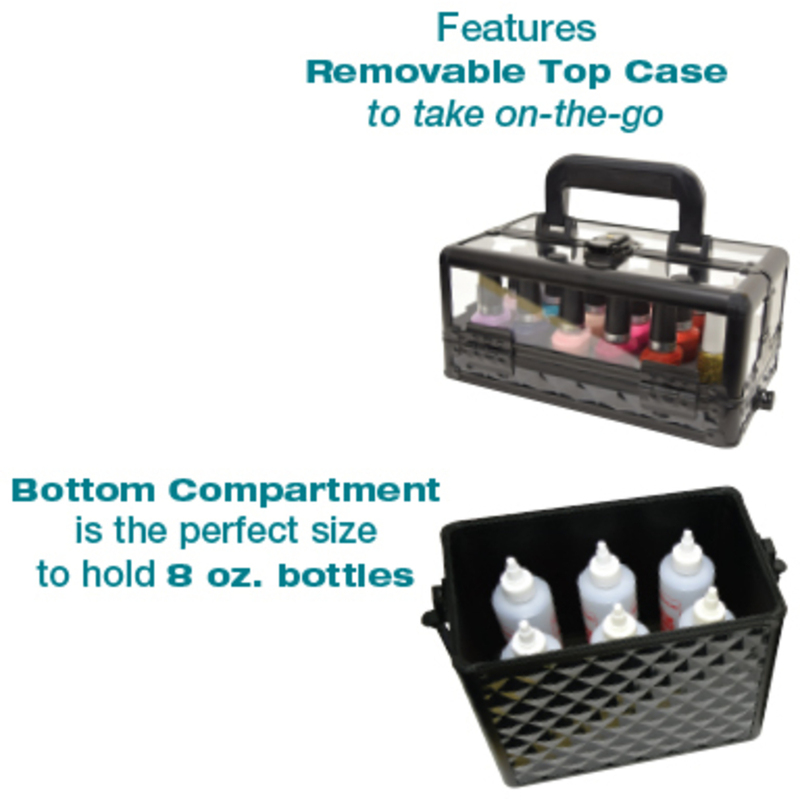 Great for transporting nail polishes, nail art, lotion bottles, and nail solutions. Comes with 4 keys. Top compartment features: Clear top case with black aluminum trim Carry handle with comfortable rubber grip Removable foam insert with 18, 1-1/4" holes for standard-size nail polish bottles and inserts for smaller nail art bottles Lockable top latch Measures: 4-1/2"H x 10"W x 6"D Bottom compartment features: Beautiful, leather-like interior Spacious depth for storage Removable foam insert with 6 holes perfect for 8 oz. bottles 2 lockable latches on each side Measures: 8"H x 10"w x 6"D. Total Measurement: 12-1/2"H x 10 w x 6"D.
Sturdy, quality construction and a stylish design make this Black Smooth Professional Rolling Aluminum Cosmetic Makeup French Door Opening Case With Large Drawers, Extendable Trays And Brush Holder a terrific choice! In today's fast paced world, everyone is constantly on the look out for convenience and quickness, especially when it comes to looking good. Who has time these days to blow dry their hair in the morning anymore? I most certainly do not, and I'm sure most of your clients would agree! This is where dry shampoo comes in! Did you know that this amazing, super trendy product has actually been around for centuries? According to an article I read, sometime around the late 15th century, the first historical reference of dry shampoo was used when people in Asia were putting clay powder on their head. Here in the states, dry shampoo was during the late 1700s and early 1800s when ground starches were used to color and deodorize the wigs of our forefathers. Who ever would have guessed?! But what exactly is this glorious and apparently historically monumental product?! Dry shampoo is basically any type of product that is applied to one's head to rid the scalp of dirt and odor without using water. It's magic in my eyes, and as an avid user, I would most certainly recommend you have your salon fully stocked for your clients. We have a great dry shampoo called Perk Up by Amika Obliphica that I absolutely love! It's an ultralight formula made with buckthorn berry extract which helps repair split ends and strengthen and nourish hair for a shiny, smooth finish. It's great for all hair types - even your clients with color treated hair! All they need to do is spray it in their roots, brush it in, and style. The lively and colorful packaging will pop out on your retail stand as well. Prolong your client's blowouts by encouraging them to try out this product, and I promise you they'll be hooked!